According to Wikipedia. Soils in the Fairfax area mostly belong to the Tocaloma Series as classified by the U.S. Soil Conservation Service. According to Moonalice legend, Tocaloma derives from two Moonalice words: loma, which means soil; and toca, which means to smoke. Soil that's good enough to smoke. Now you know. Next time there's a drought, you guys are all set! According to Moonalice legend, Fairfax's first constable and Chief of Police, Andy Peri, did not understand the Moonalice tribe. He served from 1925 until his death in 1959 and had a very narrow view of what was acceptable in Fairfax. He used to stand at the Fairfax train platform with a stern look and shake his head "no" at anyone who looked scruffy, had a beard, or might be "undesirable." Fortunately, most in the tribe were too buzzed to notice. 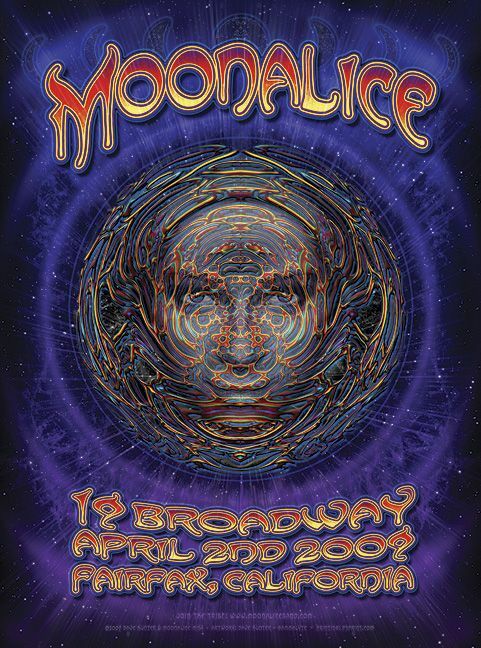 According to Moonalice legend, Fairfax was once home to Tamalpais Moonalice. Born in the latter part of the 19th century, Tamalpais was a big man and clever, too. Uncharacteristically for Moonalices of the male persuasion, he was industrious. He was constantly inventing stuff. At the age of four, he invented the Hempolator, which took freshly cut hemp plants and turned them into bathtubs with lion paw feet. He also invented Hempfish, which was a proto-vegan sushi that tasted like, well, hemp. But Tamalpais' greatest contribution to Moonalice culture was the invention of hemp strings for standup bass guitars. The tone was terrible, but they smoked like a dream. According to Moonalice legend, Phoenix Lake is a spiritual place for the tribe. Legend has it that a great Moonalice medicine man, Owsley the Bear Moonalice used to smoke hemp products on the shores of the lake. Wherever he dumped his ashes a new hemp plant with watermelon-sized buds would grow. Next time you go to the lake, try it yourself. According to Moonalice legend, today, April 2, is International Children's Book day. We bring this up because we are children at heart and hope you are, too.